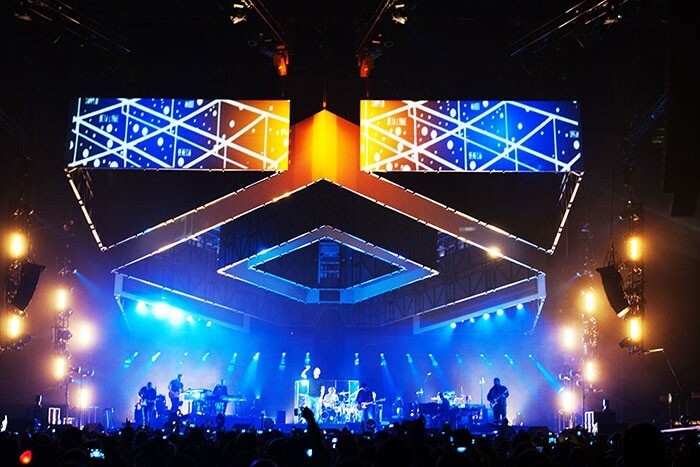 Italian singer-songwriter Eros Ramazotti opened his 2013 European tour in Italy last month, with Tait helping to bring his spectacular set design to life. Set and lighting designer Jvan Morandi worked with Ramazotti on the NOI World Tour, which will travel throughout Europe over the coming months. The design concept was made of three separate influences which are woven together during the show. Tait provided a rolling main stage including the band riser package, trapdoors and a set of magic stairs for performer and technician access. The show opens with the main stage closed down and covered by the projection ceiling, a custom scenic element that consists of six geometric pieces. Each piece then flies away to reveal Ramazotti and his band. These elements created a 3D projection ceiling giving Jvan the versatility to form striking shapes and aerial effects during the show. With projectors positioned at front of house, stage left and stage right, all surfaces of the projection ceiling were utilised to create multiple looks from every seat in the arena. The downstage face of the two upstage triangles also had a 12mm LED screen that was two meters tall and six metres wide. These screens were accompanied by two 12mm video screens that hung just upstage of the projection ceiling. This created a multitude of layers to the video content and extensive depth in the field of view. All six of the projection ceiling pieces are hung from 500kg variable speed chain motors. Controlled by Tait/FTSI’s Navigator automation software, each piece of the projection ceiling gave location feedback to the show’s media server, in order that content was perfectly mapped to the automated set pieces. The pieces were moved into a number of shapes throughout the show and used to block off parts of the main stage, providing more intimate performance areas. The show is a strong example of Tait’s ability to use a hybrid of standard rental components combined with custom pieces to provide a totally unique design concept.